I specifically remember the day I realized I could read. It was in first grade, and although we’d been learning to read at school, it hadn’t yet occurred to me that I could pick up a book and read it by myself. I was used to asking my mom or dad to read to me. Until I picked up one of my books and knew what it said. I don’t remember what book(s) I read that day, but what I do remember is that light-bulb moment. It was a heart-pounding, from black and white to Technicolor moment of “Oh my god, I can read, I can read!” I ran through the house, grabbing and flipping through the pages of every book I could. I was so freaking excited and proud. It was as if I’d stepped into this whole new amazing world and the possibilities and adventures ahead were infinite. 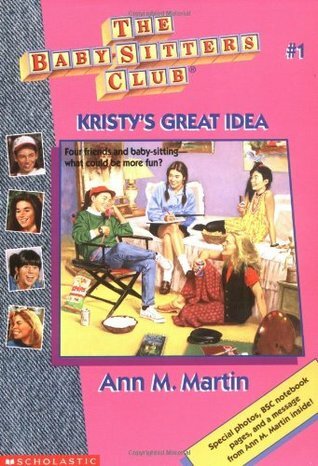 In sixth grade, I was obsessed with The Baby-Sitters Club. TWO BABY-SITTERS CLUB BOOKS I HADN’T READ YET?!?!? Yes! And the day the order would come in? YES. I’d race home and readreadreadread super fast and ultra-furiously. I could barely handle the drama! The friendships! The misunderstandings! Secrets! (No, Stacey actually can’t have all that candy!) Family issues! (That Janine was mean!) Tears! (Oh no, Mimi.) Heartbreak! (Ashley Wyeth and Claudia: I shipped you.) My crush on Claudia! And Logan! I really loved that there were so many characters to hang out with. With so many different personalities and subplots throughout the series, I had a lot to look forward to. I loved reading about Kristy while also wondering what was going on with Mary Anne at the Johansson’s house. What was happening in California with Dawn’s dad and what cool sweater would Stacey be wearing tomorrow? Hmmmm, what kind of candy would Claudia have stashed under her bed at the next meeting? Then, noooooooo. I’d finish the two new books before the night was over. The high was gone, gone, gone. Then I had to re-read and scrounge around the library for old books until I got my next fix of a shiny new story. Seriously, guys. Those books were literally drugs for me. I definitely think The Baby-Sitters Club influenced my writing. As a young teen, aside from writing short stories and sketches, I did a lot of drawing. I would draw characters, give them names and create fantastically trope-ish stories in my head. Doodles included Baby-Sitters Club characters in their totally 80s clothes, all ready for new adventures. Naturally, I did some amazing original casting as well. The triplets… Staci, Casey, Tracey! I love a story with a big cast, and like to write with one as well. I know that can be hard for some people to keep up with, and I do agree that sometimes it can be a distraction from the main event, but I can’t help it! Seeing what’s going on with everyone else is a pleasure for me. I’m super nosy. So, I love creating new side characters and I love hanging out with them. Everyone has their own story and it affects how they interact with everyone else. Liars and Losers Like Us has a pretty big cast as well. I’m very connected to Bree and Sean, but also have a place in my heart for their friends and frenemies. I’m going to miss them. Even though, just like I did for The Baby-Sitters Club, I’ll still be writing new stories for them in my head. Running from February 15-21, 2016. Ami Allen-Vath is a MN born writer living in NJ, and has lived in six other states and one country in between. Aside from books (especially contemporary), Ami's into The Walking Dead, yoga, warm vacations in the wintertime and ice cream in any season. She is the debut author of Liars and Losers Like Us, which will be released March 15, 2016.